As Tekken 7 will release its console copy on June 2, 2017 it is also announced by Namco Bandai that they will delay release in the Philippines up to August 1, 2017. The reason is because they are going to release it on August 1, 2017 is because it's the Month of Imperial Tagalog. The difference between Tekken 7 and Tekken 7: Philippine Edition will differ in content and storyline. A fully Filipino development team was already working on this game since 2015. 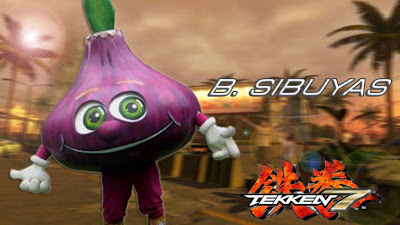 Tekken 7 Philippine Edition will not only include a joke character named B. Sibuyas and Jollibee will be an exclusive character. We will also feature other stuff exclusive and only in the Philippines. We announced we would have a Story Mode. But this time Fated Retribution will include storylines such as Mama Si Papa Napaano, Hacienda Luisita, ABiaS-CBN, GMA-7 and Kipadilawan storylines which will not be found in the original game. The plot of the Philippine edition will also tie a story between the Mishimas, the Cojuangcos, the Aquinos, the Marcoses, the Bitays and the Estradas. Part of the storyline will also feature Antonio Trillanes IV and Nobita Aquino having backdoor deals. You will see a fictional retelling of certain events like the Hacienda Luisita Massacre. Something dark will be revealed between the Aquinos and the Mishima Zaibatsu in this game. The game would also include outfits and accessories found only in the Philippines. One of the outfits would involve the use of Filipiniana dresses, barong, baro't saya and the traditional farmer outfits. There will also be bonus soundtracks that will be performed by Paolo Montalban who played as the Great Kung Lao in Mortal Kombat Konquest. The contents of the game enraged Nobita Aquino supporters. Antonio Trillanes IV was frustrated with the preview cut scene that features him having a back deal with Heihachi Mishima during the events of Tekken 4. Also, there are scenes of Leni Loud Robredo in the Mishima Zaibatsu as a test subject for a facial cream that makes your face thicker in three days. Also, a controversial scene right now also involves Bum Aquino getting beaten by Lili and Asuka for attempting to molest both girls. What are you waiting for? Pre-order now!